The Catinaccio is a paradise for excursionists and the Vajolet refuge is right in the centre of this breathtaking landscape. 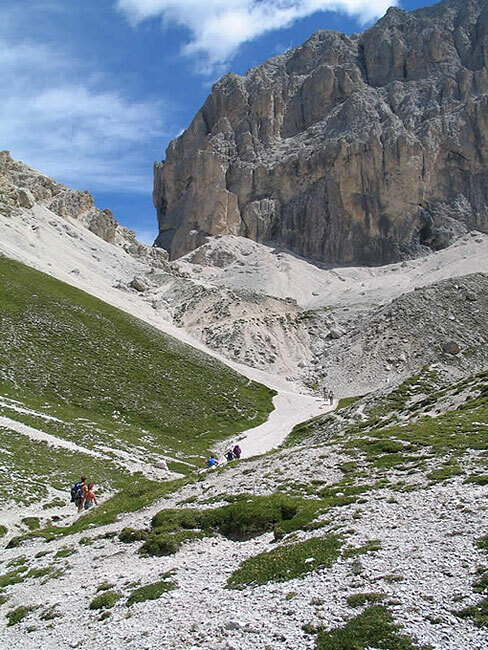 Different excursions are possible departing from the Vajolet refuge: towards the famous Vajolet Towers (sought-after destination of all climbers), towards the Santner pass, towards Cima Antermoia or the Antermoia pass, etc. Many other refuges can be reached from the Vajolet refuge: the Re Alberto, Passo Santner, Gardeccia, Principe pass, Antermoia, Roda di Vael, Coronelle and many more. 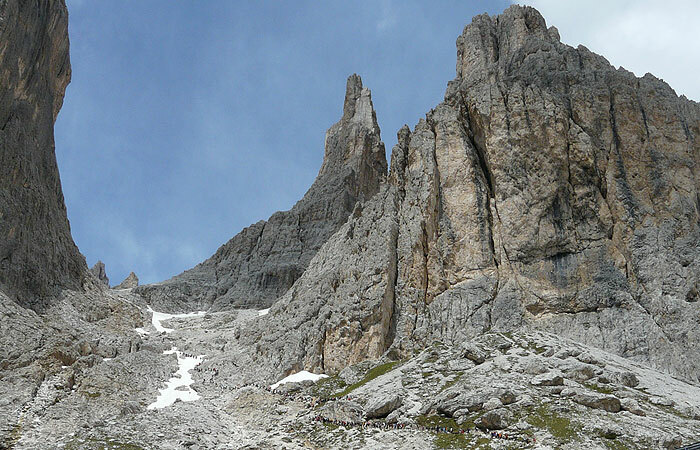 The refuge is also the starting point for many climbs on the famous East wall of the Catinaccio ( Steger route– Kine route– C.A.I. 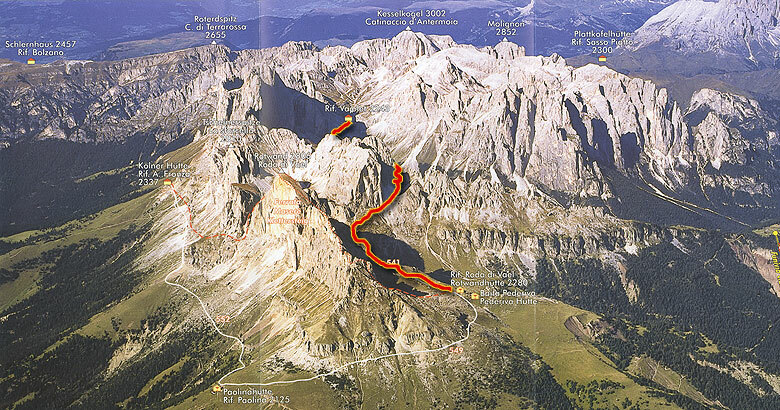 Alto Adige route – Dimai route – Cresta Sud route – Fantasia route and many more). 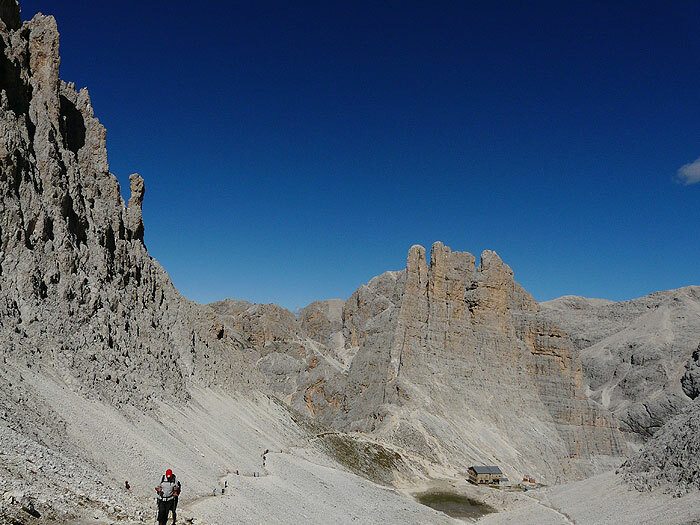 On the Punta Emma Steger route – Fedele route – Piaz walk – Einstecker route and many more. 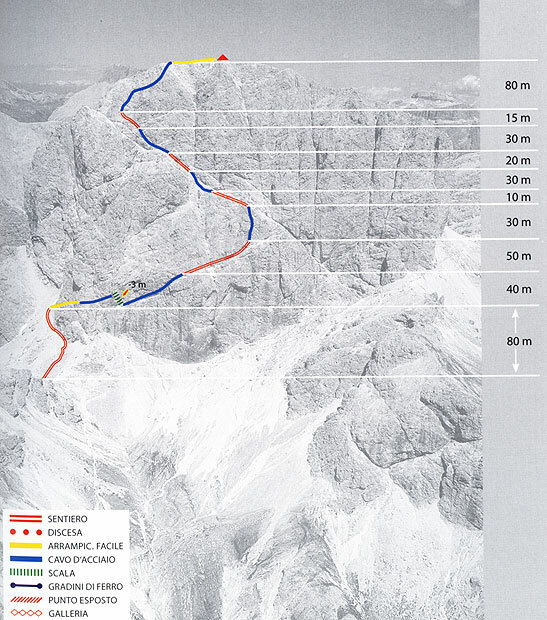 On the Vajolet Towers Spigolo Delago – Ferman route and normal route on the Stabeler – Steger route and normal route on the Winkler. 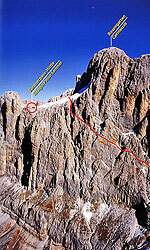 The via ferrate of Passo Santner and the Catinaccio of Antermoia. Starting from the Refuge Vajolet follow the descending way for about 300 meters in direction Gardeccia and afterwards turn into the right way n. 541 leading to the Cigolade Pass. 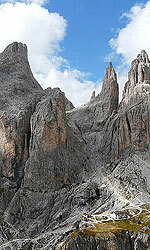 Arrived at the Cigolade Pass, walk along the same way n. 541 winding downwards to the Refuge Roda di Vael. Duration: 2 ½ - 3 hours, difficulty: medium – easy. From the Refuge Vajolet follow the way n. 584 ascending to the Passo Principe (1 hour) for continue on the same marked way to approach the Antermoia Pass and afterwards the Refuge Antermoia. Duration: 2 ½ hours, difficulty: medium – easy. 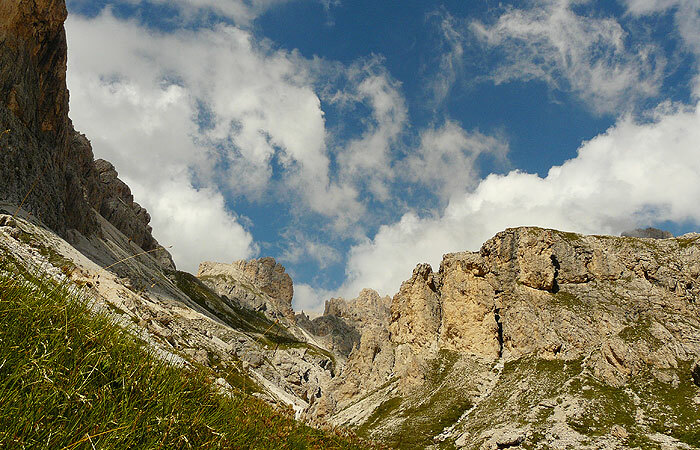 This route features another possibility: proceed on the way n. 583 to reach the Lausa Pass and approach the Scalette Pass, partly consisting of a metallic fixed climb trail, leading finally to the Refuge Gardeccia. The returning path to the Refuge Vajolet is marked with n. 546. 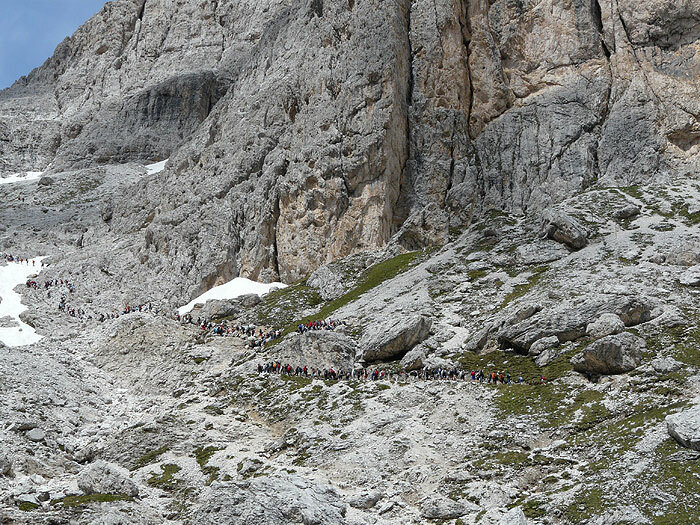 Duration of the hike route from the Refuge Antermoia: 4 hours. 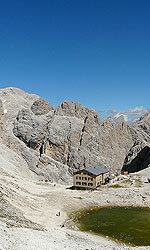 At the Refuge Vajolet, choose the way n. 584 with direction Passo Principe. Proceed on the way n. 554 leading to the Molignon Pass and afterwards down to the Refuge Alpe di Tires. Duration: 3 – 3 ½ hours, difficulty: medium – easy. short climbing trail, completely secured with steel ropes, a short and simple ascent on a ladder, in spring crossing of an icy slope (mostly secured by a rope), the second part of the trail requires absolute surefootedness (ascent on not secured rocks, short climbing sections on I grade). across the Val d’Ega until little before the Passo di Costalunga – follow the junction to the Passo Nigra until the Frommer Schwaige. Frommer Schwaige - ascent by chairlift, up to the Fronza Refuge, 2339 m. Opening time of the chairlift in summer: from 26.05. until 26.06. and from 05.09. until circa middle of October 8:30 – 12:15 and 13:30 – 17:30; from 27.06. until 04.09. from 8:00 – 12:15 and 13:30 – 18:00.
upside the Fronza Refuge (open from 25.06. to 25.09. – restaurant open until 25.10. ), rise on partly secured rocky stairs and after follow the way n. 542s leading to the climbing trail’s starting point. The upper section to the approach features some short very exposed and not secured free climbing passages (I – II grade). 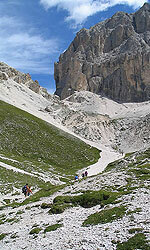 This is a relatively short trail with possibility of extension by walking round the entire massif of Catinaccio. The ascent and descent along the climbing trail requires surefootedness and alpine climb experience due the short free climbing passages on the way to the approach. Variant for the descent: from the Refuge Passo Santner approach the Refuge Re Alberto and the Refuge Vajolet shortly below the climbing trail exit (signpost 542s). Now, continue the walk on the drivable road until the junction with the direction Coronelle Pass (signpost 541). 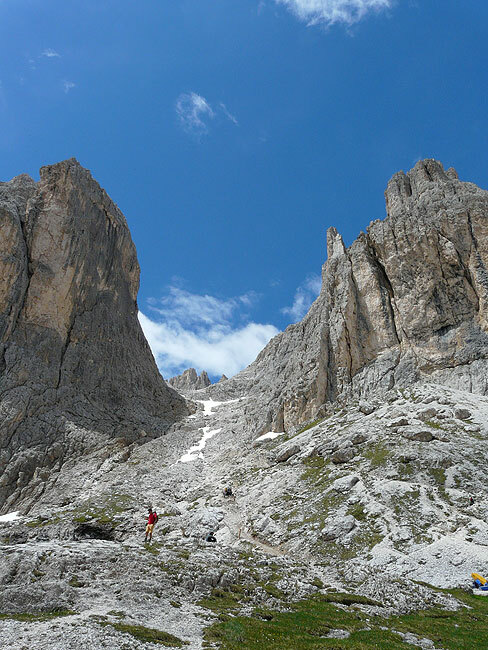 A steep way rises up to the pass (signpost 550) and on the other side steep down to the Refuge Fronza. 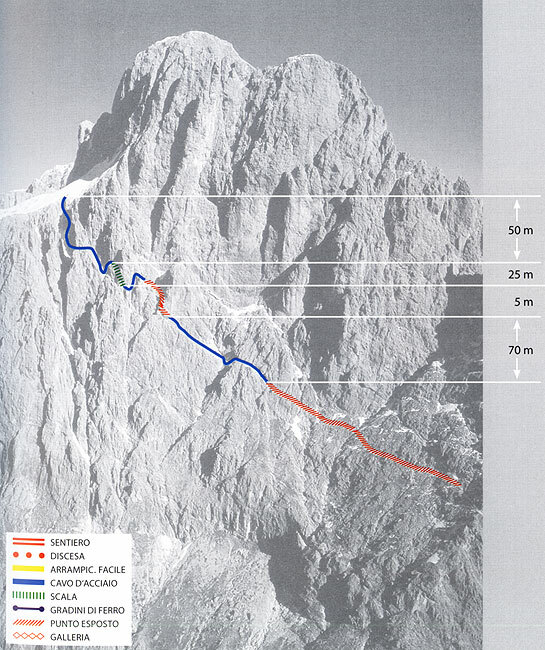 For this alternative route calculate further 430 meters in altitude and 1 ½ hours in ascent and 560 meters in altitude and 1 ½ hours in descent. 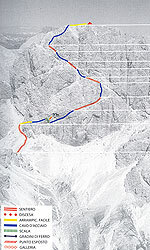 A short metallic fixed rope trail secured at full length with ropes and with a short ladder on a vertical rock face. 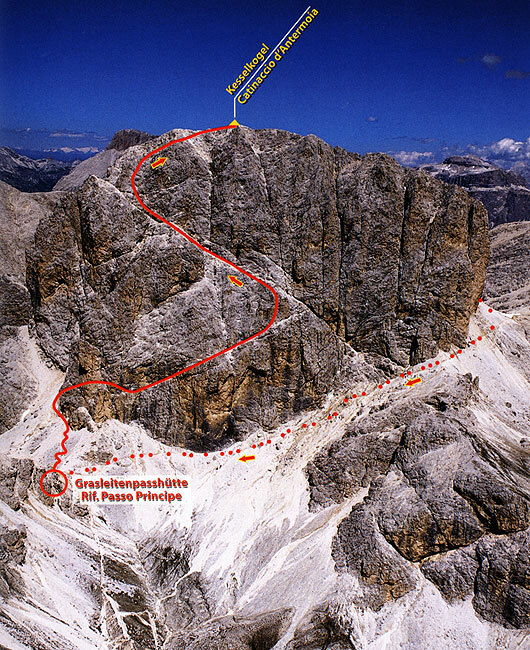 Approach partly on an exposed steep way, short sections of free climbing (I and II grade). The once notorious icy slope may feature some snow rests in springtime. 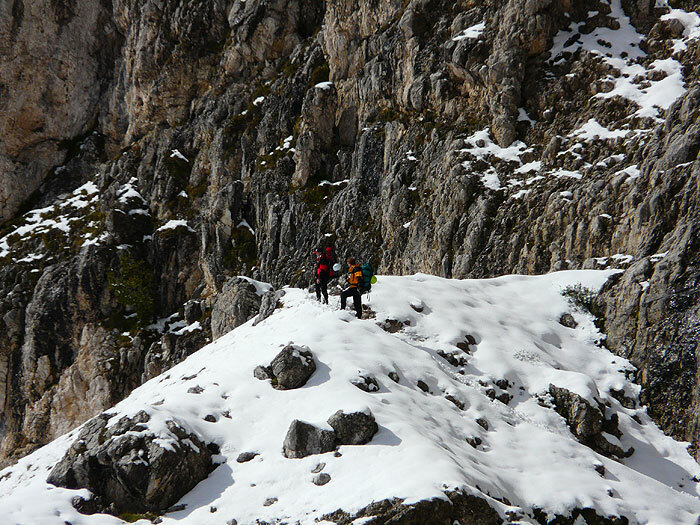 The crossing on the hard snow is mostly facilitated by a rope, but nevertheless to approach with care. descent on a short and exposed ladder, sections of free climbing (I grade) and the rest of trail winds along rope secured ways. 60 % with steel ropes, 1 % with ladders, 13 % of easy climb, 26 % on steep paths. 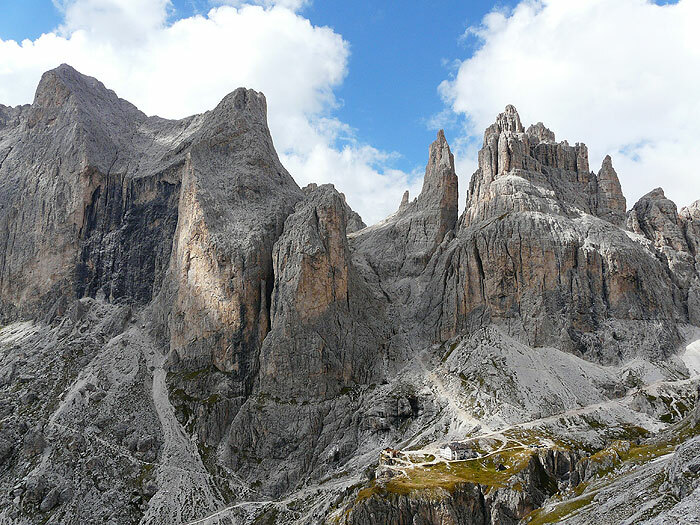 reach the village of Vigo di Fassa from the Val d’Ega across the Passo di Costalunga or passing through the Val di Fassa . This is the location of the funicular Ciampedie (upper side of the village). 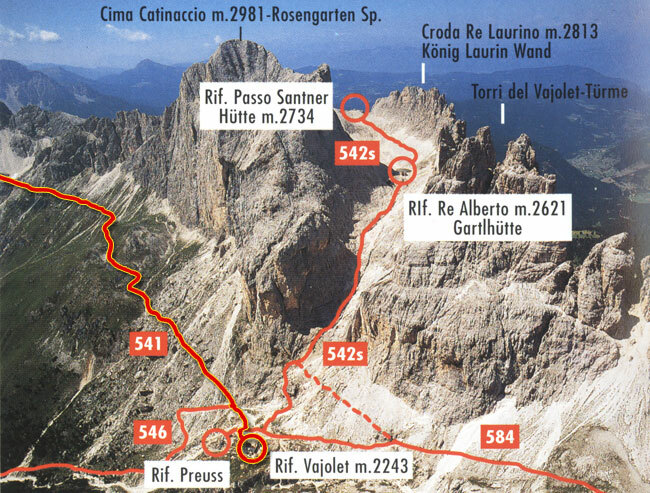 from the funicular follow the drivable road n. 540 to approach the Refuge Gardeccia, 1963 m. Now, walk along the way marked n. 546 in direction Refuge Vajolet, 2243 m, for rise to the Passo Principe along the way n. 584. 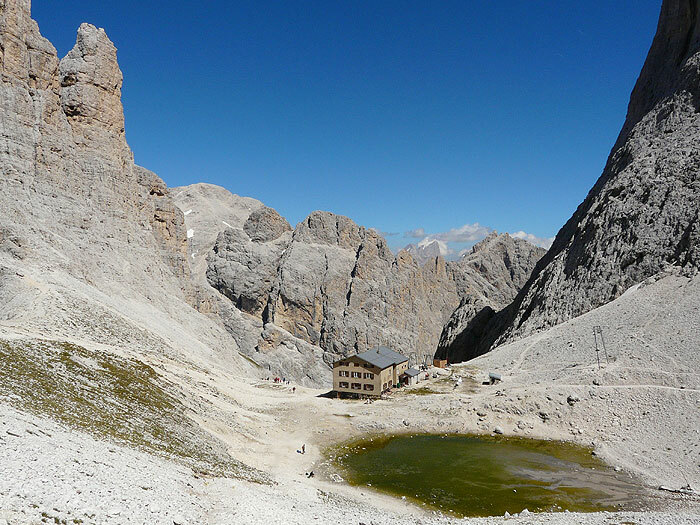 The Refuge Passo Principe, 2601 m, is opened from middle of June until the end of September. 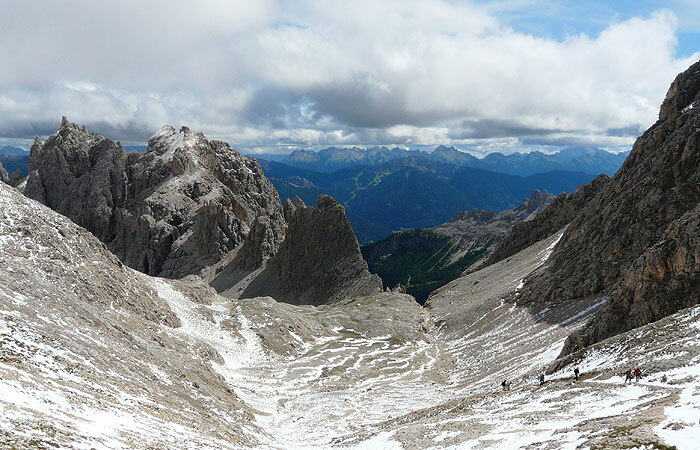 An attractive day trip with lots of panoramic views for very experienced alpinists. The route variant with the descent along the eastern rope climb is much extended and not to underestimate. Especially at the beginning of summer, it’s recommendable to pay attention at the residual snow during the crossing of the eastern rock face. The securing ropes may still be snowed in on the inclined ledges. 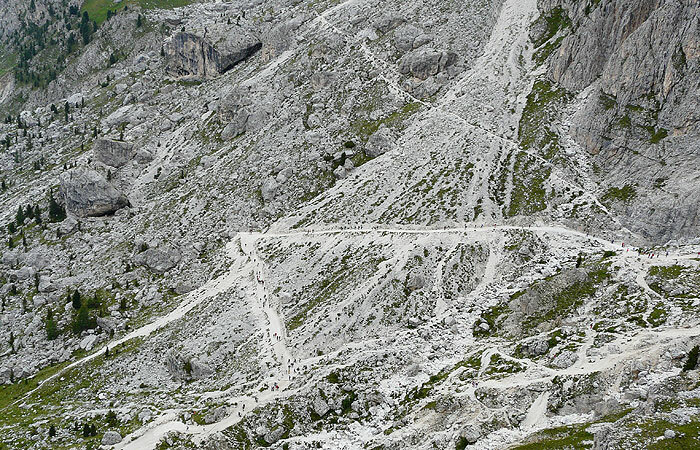 In this case it’s recommendable to descend along the western metallic fixed rope trail. 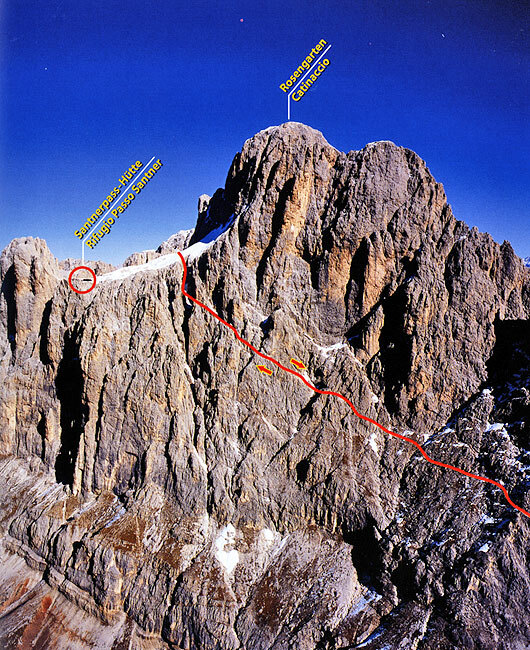 From Ciampedie the distance to the metallic fixed rope trail is relatively long. 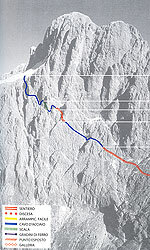 The passages in free climbing require absolute surefootedness in the ascent as well as in the descent. 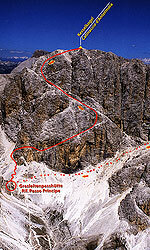 The most important things for this trail are the excellent whether conditions and the alpine climbing experience.